The main objective of WA 4 is to improve the predictions of nearshore morphological changes under storm-surge conditions, which are assumed to lead to significant erosion but still are usually neglected in long-term predictions. The dominant transport direction under storm-surge conditions is cross-shore and sediment is mainly transported in a thin layer above the bottom, the so-called sheet flow. Existing transport formulas and numerical models usually describe the sediment using a single (mean) grain size. However, natural sediment is widely graded (i.e. consisting of a number of different grain sizes). It has been shown in previous studies that the interaction of grain sizes can lead to transport rates which differ significantly from those of a single grain size. The aim of WA 4 is the development of a transport formula which can represent the behaviour of graded sand. 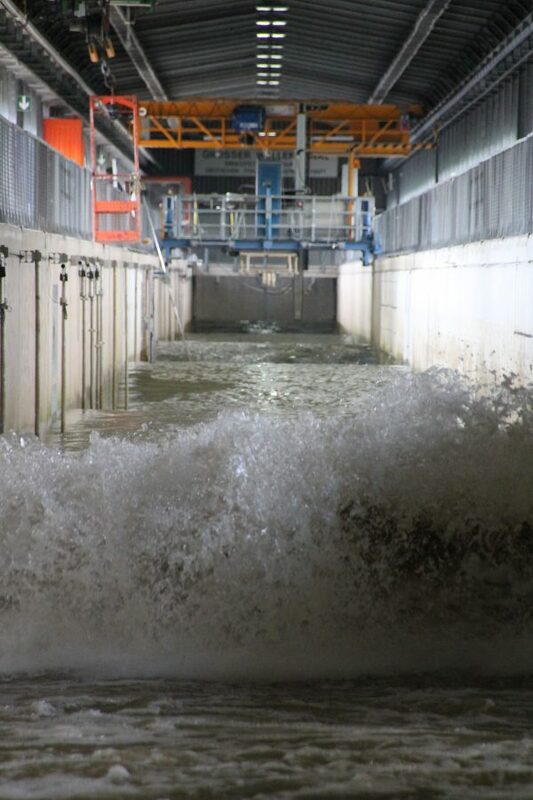 After many months of preparation, a series of large-scale experiments were conducted in the Large Wave Flume (Großer Wellenkanal, GWK) in Hannover in May and June 2018 to provide a solid database for the development and validation of the new formula. The new formulation will eventually be implemented in regional-scale numerical models to improve the prediction of erosion processes during storm events.